direct rival, the Subaru Impreza WRX STI, you'd be hard-pressed to find another car in this segment with features like Active Yaw Control (to maximize grip), a limited-slip differential, Bilstein upgraded suspension, and high-performance Brembo brakes. The Mitsubishi doesn't hide its intentions, either. This car has an obviously gaping front end that is proud to show off its AMS (Alpha Motorsports) upgraded front-mount intercooler. Just below it, the aerodynamically inspired front lip spoiler aids this car's potential for downforce. Moving further upward, the hood has a trifecta of design elements that each carry their own functions, whether it's to counter drag or to release heat from the engine compartment. The Phantom Black Pearl paint color shimmers with holographic hues of red, while it is nicely contrasted by the semigloss set of Varrstoen ES2 wheels. These wheels do a perfect job at exposing the bright red Brembo four-piston calipers from beneath them. As a 2010 model, it's gifted with a pair of black-housed tail lamps. The aerodynamically-advanced diffuser houses a pair of single wall exhaust tips underneath it. Behind each front wheel, you can find functional fender vents. Another minor touch is the pair of custom fitted carbon fiber racing side mirrors. The interior is also designed with performance and thrills in mind. Just by looking at the suede-upholstered Recaro racing seats, it's easy to see that this cabin is prepared for some high G-force cornering. For true performance enthusiasts, the A-pillar of the car houses a boost gauge and an AFR (Air/Fuel Ratio) gauge provided by AEM. As appropriate in a performance car, everything from top to bottom is finished in black, except for the anthracite colored trim panels. The cleanly installed Kenwood head unit contains features like Navigation, Bluetooth connectivity, USB input, satellite radio, and more. Apart from the track-focused functions of this interior, this car still has enjoyable features such as Active Stability Control, Active Yaw Control, Voice Command, Fog lamps, a digital gauge cluster, auxiliary and USB functionality, rear folding seats, a high-capacity trunk mounted subwoofer, and more. It's hard to find Lancer Evolution levels of thrills from other cars. This car is said to handle as sprightly as rear wheel drive cars, despite its all-wheel-drive configuration. This means that drivers will have the best of bothy worlds while behind the wheel. Unparalleled levels of grip are available, both on and off of track environments. Take this car out in the winter, and you will experience no degradation in its ability to get you safely from place to place. Hearing the growl of this optimally tuned 2.0 liter four cylinder engine is more than inspiring. That sound that you'll hear is greatly aided by the high flowing custom turbo back exhaust. From the front of the car, it's hard to obtain youthful temptations from the sounds being emitted. This car makes its turbocharger present with an AMS upgraded intake system and a Tial blow off valve. The clutch has just the perfect blend of stiffness and smoothness to make for a sporty feeling daily driver. The amount of feedback granted to the hands of those commanding the steering wheel is highly satisfying, too. Part of what makes the Mitsubishi Lancer Evolution so special is its ability to offer immense levels of performance to the public. With that being said, it's a reliable and affordable powertrain, despite having supercar-like capabilities. As evidenced on the Carfax vehicle history report, this particular car has never been in any accidents during its lifetime. The way this car runs and drives is outstanding and almost difficult to put into words. Many would expect a rough ride from such a capable powertrain, but that's not the case here. We've had this car checked multiple times to ensure that it will be a dependable vehicle for you to take home. At this point, all maintenance requirements are up to date and this car is ready to be driven to a new home. If long term ownership is a possibility, feel free to ask about our extended warranty options. 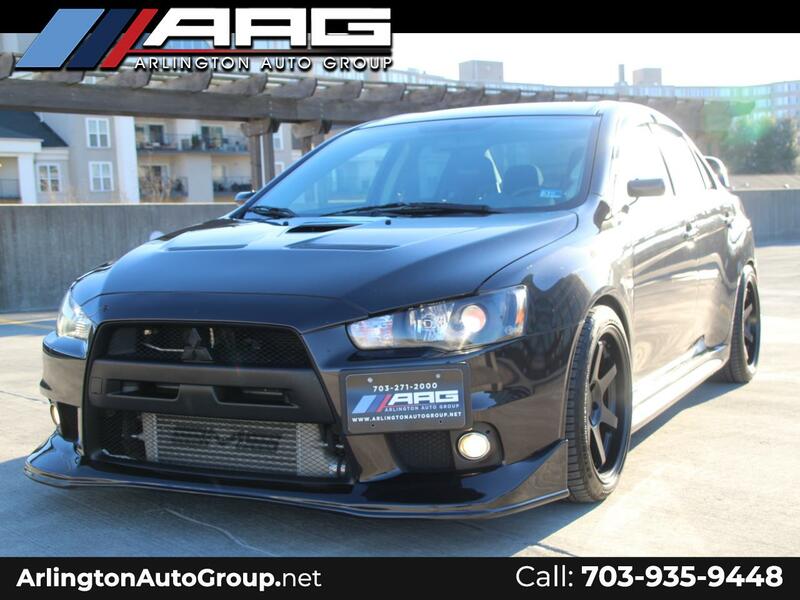 The Mitsubishi Lancer Evolution is no longer in production, so this car is getting harder to find. This particular model is in excellent overall condition, and it's a manual GSR model, which boosts its exclusivity even more. If you want a true Japanese performance icon in your driveway, now's your opportunity to claim yours! To book your appointment for this car, or for general inquiries, please contact us at (571) 260-3207. Arlington Auto Group Where your satisfaction, exceeds your expectations! Message: Thought you might be interested in this 2010 Mitsubishi Lancer.